This was the huge face looking at ME! 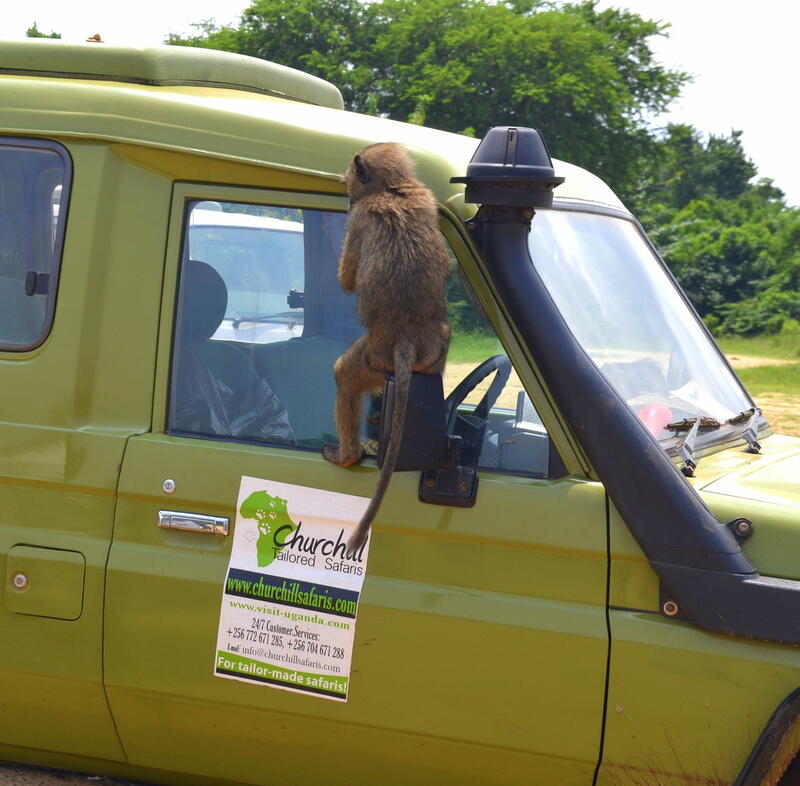 There was a thud sound in the back seat, followed by our safari van shaking briefly. Emmy turned to look and then I turned to look. 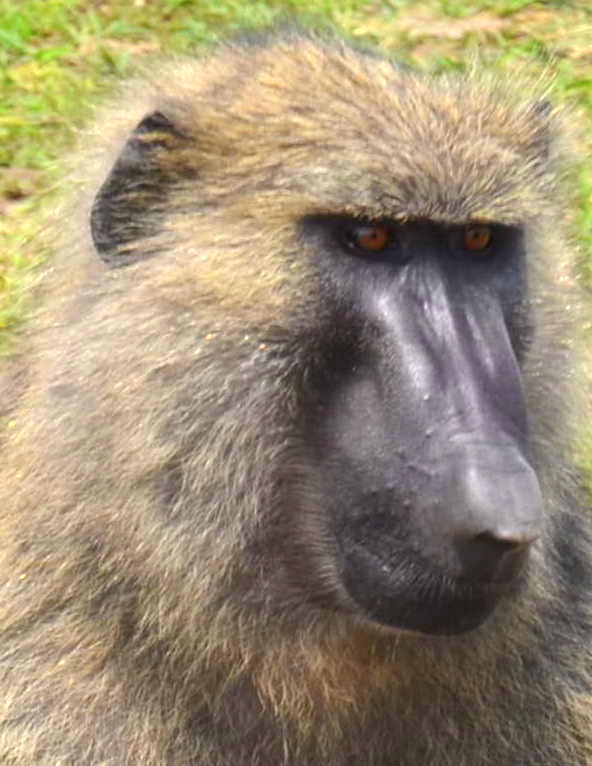 There looking straight at me was a huge 3-year-old 50-pound male olive baboon 24 inches from me with dark orange glaring eyes and a big, black shiny nose almost the length of his head. He looked the size of a human as he sat about 30 inches tall. Totally shocked at what I saw in the back seat, I screamed and June then turned to look and she screamed. All three of us in the van were screaming for the “Trouble” to leave and while we were screaming, he was just digging and digging with his right hand in my black fabric tote bag for food as he sat on his dusty, dirty feet and looked at us. He was not in any hurry or scared because he was a full-time food thief. 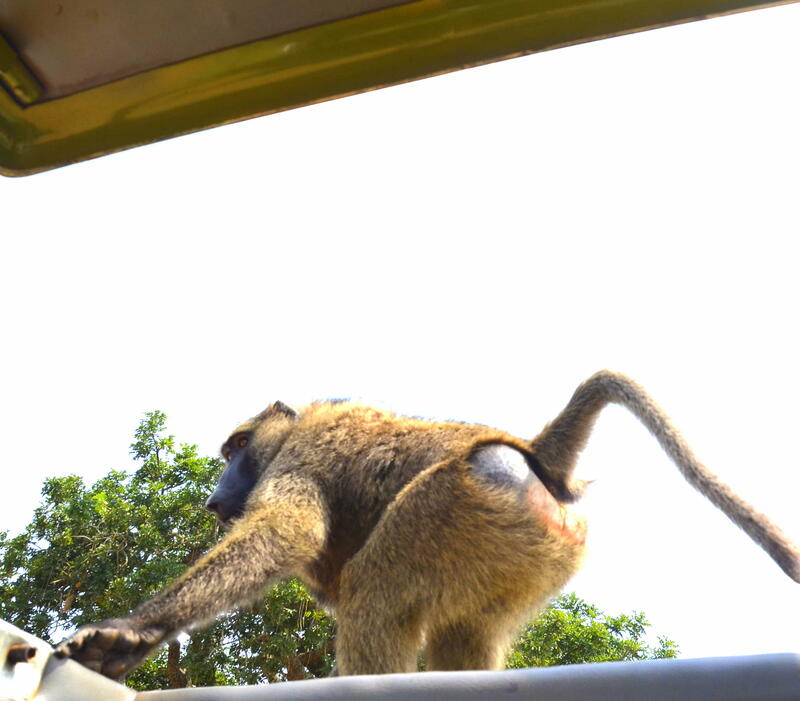 left through the open top of the safari van just like he had entered. This monkey is sitting on the mirror to look in! 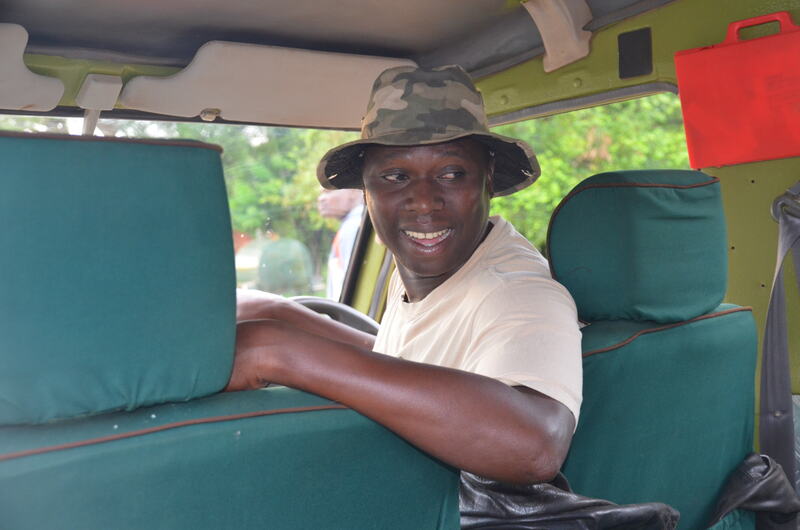 Emmy Maseruka, our safari driver, with http://www.afrikanwildlife.com told me that he had made previous eye contact with Trouble who was checking out the van contents. 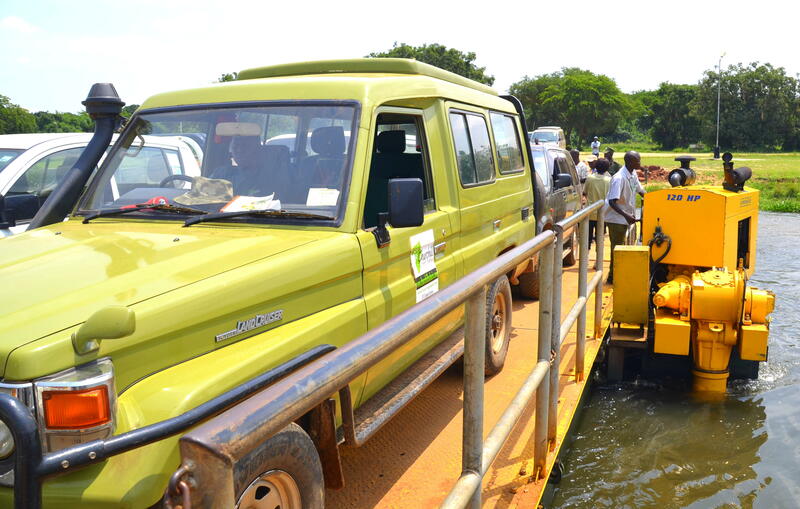 But we had no clue he would enter the safari van while we were waiting in line to board the ferry that would take us from the north side of the Ugandan Victorian Nile River to the southern side and our hotel. We did not have any food sitting out or plastic bags in sight. They check all windshields and angles before entering a vehicle. 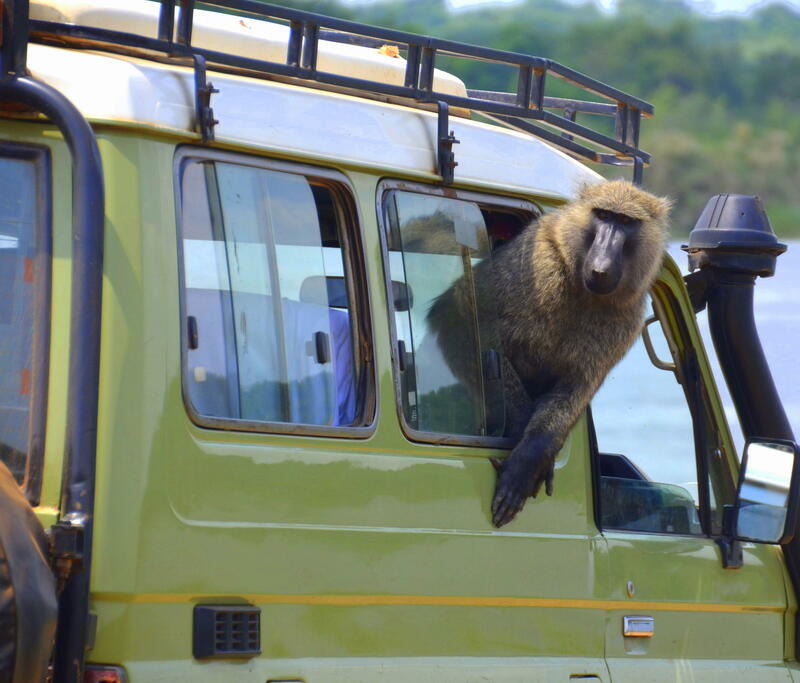 Emmy had told us about the baboons when we first began our tour of Uganda warning us to keep your doors and windows closed at all times, and we had all closed in the safari van. He said the baboons are always looking for plastic bags because they see everyone carrying plastic bags and most of the time food is in them. But Trouble came in through the open safari roof. 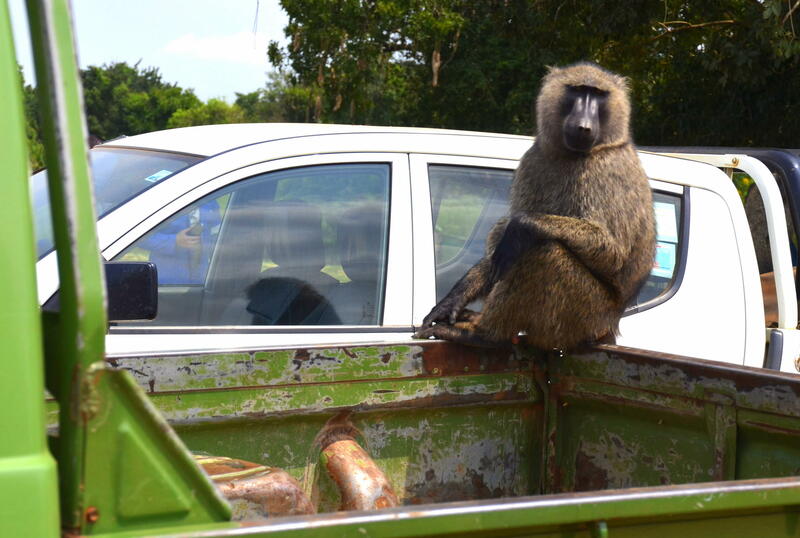 What amazed us was that baboons will enter a vehicle whether it is empty or occupied. They don’t discriminate when they want food. Emmy said if a baboon wants a man’s food and the man doesn’t give it to him, they will fight and bite him. 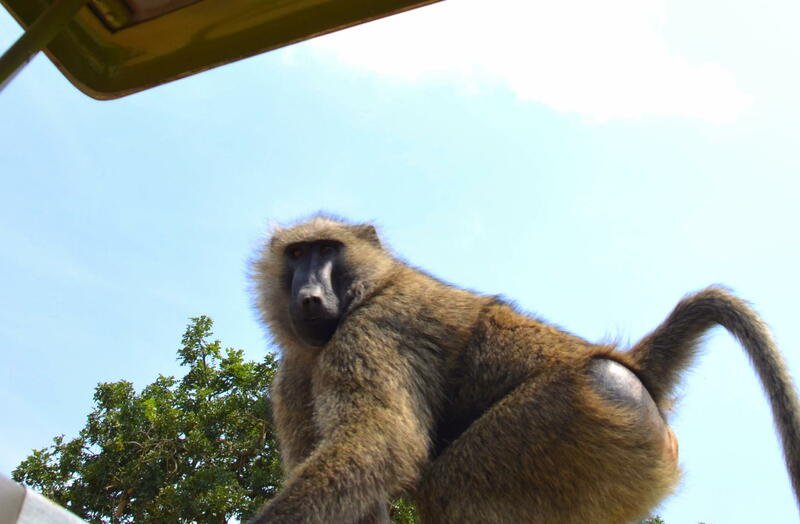 But, if it is a female the baboon is stealing from, he will threaten and threaten her persistently and will not back off or leave until he gets what he wants, but he will not fight or bite her. A few minutes after Trouble left our van, I checked my tote bag to see if I had food in it and found a bag of crackers that had not been touched by those monkey hands. Trouble’s family and friends then joined him and all of them were taking over the other vans like they owned them. 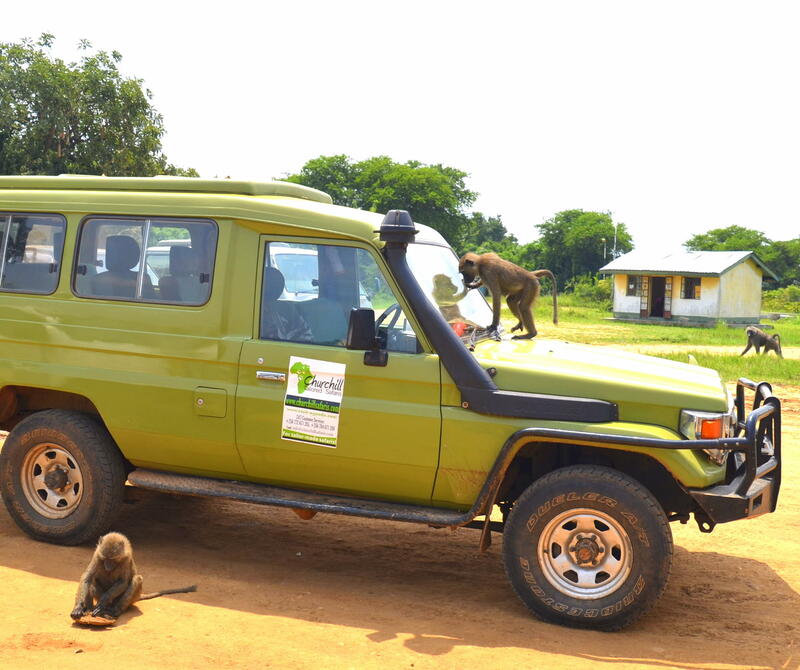 One baboon looked like he did own a green pickup truck as he was sitting on top the side of the bed at the intersection of the tail gate and the right side. 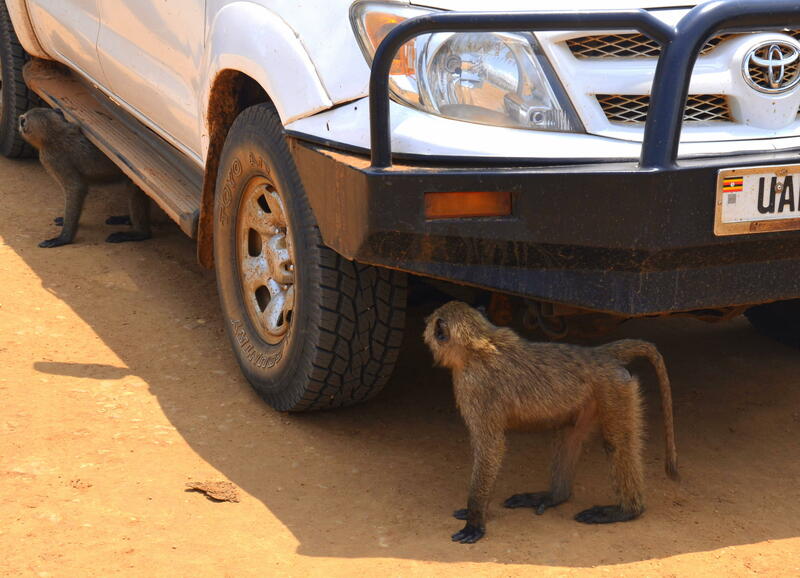 Two teenage baboons hung around watching and learning techniques from their parents under several vans. 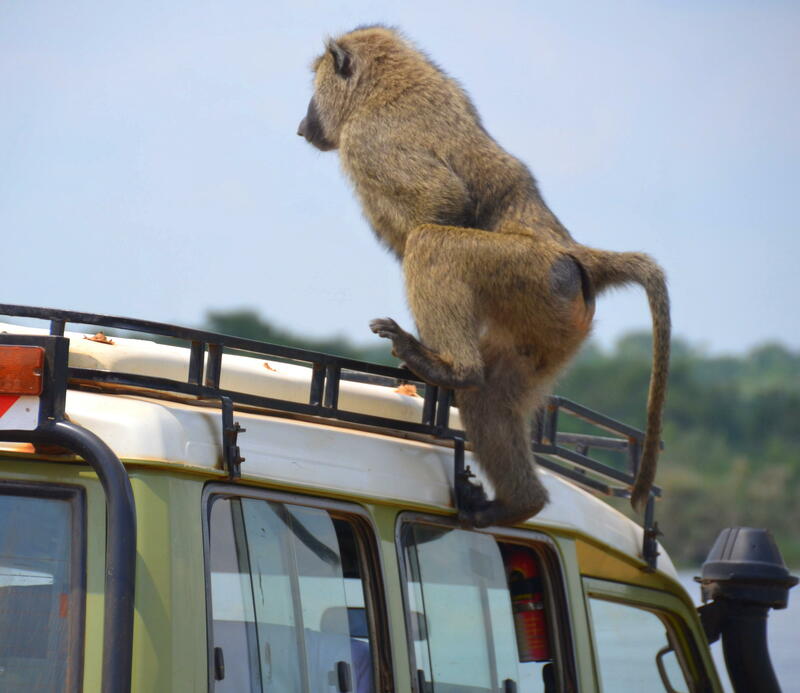 As the baboon robbing was going on, the safari guides/drivers considered it a common happening. They were laughing, and were not upset, but they finally closed all doors, tops and windows. As Trouble departed our backseat, his dusty footprints remained all over the seat cover giving us a reminder of the entire experience that lasted about 10 seconds but it gave us a one-of-a-kind adventure we never expected to have on a safari in Uganda, Africa.